Valchromat ® Coloured Throughout Fibreboard. Avon Plywood Ltd are stockists and distributors of Valchromat® We have an extensive stock of Valchromat, held at our warehouse in Keynsham, near Bristol. We are able to process cutting and machining orders for the Valchromat ® product and package the completed work on a pallet for delivery throughout the UK. We deliver on our own vehicles when viable and use courier or haulage contractors when more appropriate. 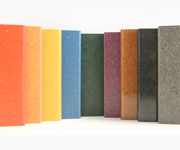 Valchromat is available in 10 standard colours plus Natural Clear (Self Colour). The colour range is currently: - Black, Dark Blue, Blue, Brown, Grey, Light Grey, Green, Orange, Red and Yellow. For more information 'Click Sizes & Thicknesses' on the right of this page. The colours are controlled during manufacture according to CIELab norms to allow standardization according to internal tolerances. Testing according to British Standards 1006 (24 hours exposed in a solar box) prove a good colour resistance. As well as its unique appearance, Valchromat ® has several advantageous properties in use and for assembly. Because of its physical-mechanical properties, considerable time and money saving come from smooth machining and easy finishing. No edging is required. Being moisture and UV resistant, non-toxic and eco-friendly, the possibilities for use are endless. Valchromat ® has been conceived to accept all kinds of finishes such as wax, lacquers, oils, wax oils and varnishes but it can also be used in its natural state. It's a board with great aesthetic versatility. Valchromat ® is a wood fibreboard coloured throughout. The wood is sourced from forest waste, residue from timber mills new and recycled pine. The manufacturing process is environmentally friendly with the production site achieving zero carbon emissions. During manufacture, organic dyes are added along with a specifically developed binding resin to ensure exceptional physical-mechanical characteristics as well as a natural appearance. Valchromat ® is classified E1 (very low formaldehyde) and has been approved by the British Standards Association for the safe use in the manufacture of children's toys. Rigorous internal standards for quality control and eco-friendly production practices apply to ensure that Valchromat ® remains a unique, high quality product. Due to the fact that Valchromat ® is derived from natural fibres and eco-friendly sustainable dyes, colour shades may vary slightly between batches. However variances remain within acceptable parameters according to the CIELab norms allied to "Datacolours" Software. Small brown chips are visible at random across the board adding to Valchromat ® unique look. Tonal variances will also occur with different finishing applications. Please make sure you have the actual Valchromat ® samples for accurate colour portrayal. Minimum quantities for special orders may apply. A lead-time of several weeks may be experienced as these orders ar e usually added to regular stock deliveries to arrive from Portugal. Valchromat is very serious about its environmental responsibility. The production site has a zero carbon emission. Investment has been to ensure that the manufacturing process involves full waste recycling, no toxic emissions and dry process production, (no wastewater). A heat recovery system, which is bio fuel run, has replaced the old steam boiler to produce all the required energy. We aim to annul all emissions caused by our industrial activity, i.e. forklifts, company cars and trucks. This is being done by the implementation of various forestry projects. We are committed to continuously improving our performance to ensure the sustainability of natural resources.